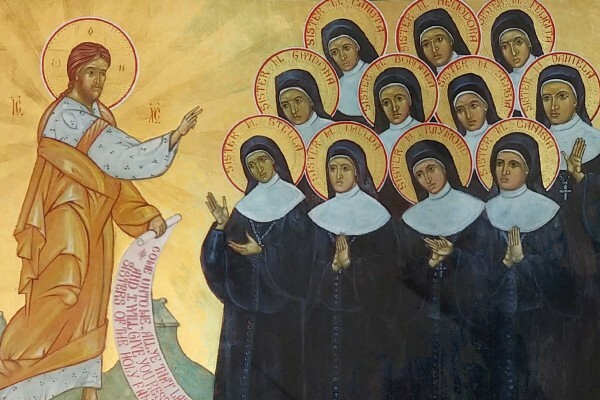 On September 4, we join with other Sisters of the Holy Family of Nazareth from around the world and our friends of Nazareth in celebrating the feast day of Blessed Mary Stella and her Ten Companions, our Martyred Sisters of Nowogrodek. These 11 sisters sacrificed their lives on August 1, 1943. At their beatification on March 5, 2000, Pope John Paul II declared September 4 as their feast day. We invite you to read more about Blessed Mary Stella and her Ten Companions in one of the Congregation’s spiritual notebooks available online by clicking here. You may also watch this video produced by Sr. Mary Bernard Wiecezak, CSFN, in collaboration with Jason Kapell. Sr. Mary Bernard recorded this video in 2010 in honor of the 125th anniversary of the Sisters of the Holy Family of Nazareth arriving in the U.S. The prayer through the intercession of the Nowogrodek Martyrs is available here.